At CommPayPro our goal is to provide one solution that allows you to manage multiple lines of business and customers. We are dedicated to providing the tools you need to run your business as efficiently as possible. Our staff is composed of team members that have been in the Satellite, Broadband, and other like industries for over 50 years combined. From sales, to logistics, to operations, to software development, our team has managed all aspects of the business and pledges to provide that expertise to help you continue your success. Since 1998 CommPay has been provided as a rich client desktop application. While this has been a successful product, we realize the need for a cloud based solution that you can access anywhere, at any time. In 2014 we initiated the project to not only convert all existing functionality of CommPay into a cloud solution, but to introduce additional functionality to make it better than ever – to make it “Pro”. A cloud environment provides the ability to deploy updates and enhancements with no interruption to daily operations. These updates will be seamless and afford you the ability to continue working with the best solution out there. CommPayPro will continue to enhance existing features and provide new and exciting features, and you will have the opportunity to be a part of it all. When you become a CommPayPro customer, you are not only going to use the product as it is, you will have the opportunity to contribute to its success. We know that you will be using the product every day and your opinions and needs are important; so let us know when you have one! We will consider all requests for improvement, and if it is determined that it will benefit our customers, we will make it happen. Call 800-444-9199 for Sales or 715-254-1899 for Support. CommPayPro provides the tools you need to be successful which brings you peace of mind and all at a minimal cost to you! The pricing structure is simple and straightforward; there’s no need to guess what you will be billed each month. You will be billed based on your usage and that’s it! No matter the size of your company or how many users will access the application, the initial setup fee is a low $299. This setup fee will get you started on the path to greater success and profits than ever before. When you sign up you become part of our team, and we will do everything we can to help you realize the success that we know our product can help you achieve. You will have full access to recurring weekly trainings on all the features of the site; join any time to learn new things, train new employees, or just for a refresher. After you get started you will pay a base rate of $99 per month plus a transactional fee per work order. This transactional fee is simply calculated on the number of work orders. We won’t bill you for more than you need or more than you use. If utilizing fulfillment modules, you will pay an additional $99 base rate per month for each provider. CommPayPro is integrated with additional services to help manage your business. Text – If you would like to utilize the text features available, please visit https://www.eztexting.com, to learn more about the service and available pricing. Credit Card Processing – To utilize the credit card processing features available, please visit http://www.authorize.net to learn more about the service and pricing available. CommPayPro is here to make your day-to-day operations seamless and stress free. Designed with the flexibility needed to support fast paced service industries like Satellite, Broadband, Fulfillment, Service and Repair, CommPayPro gives you the control to configure the system to meet your needs and provide you with full business management solutions. With over 50 years of combined experience in these industries, our team is able to work with our customers to identify what is needed to successfully manage your business. We are constantly working to provide new and enhanced features to streamline your operations. Below are just a few of the core features CommPayPro has to offer. Create and track leads for DIRECTV, Exede, CenturyLink, and others. Fully automated creation of sales for DIRECTV, Exede, CenturyLink, and others. Inventory tracking by warehouse and installer. Receive notifications when inventory levels have reached minimums and initiate ordering with your preferred vendors. Extensive staff and contractor payroll functionality. Calculate commissions for sales reps and installers to create reporting for easy payout. Track and manage fulfillment operations for DIRECTV and Exede. Import jobs, schedules, payments, and reporting. Review and reconcile vendor payments to ensure you are being compensated accurately from the providers. Point of Sale operations for store front selling abilities. Automated billing features to generate one-time or recurring billing to customers. Automatically email invoices and statements to the customers. Integrated text and emailing capabilities to maintain contact with customers and staff members. Easily upload, attach, and store documents and photos for each work order from a job site or the office. Quality Check capabilities that can be fully designed to meet your needs. You define the information important to you! Integration with Google Maps to locate job sites, technicians, and plan routing efficiently. Track employee time utilizing the time clock feature. Real time reporting on customers, work orders, inventory, payroll, and much more. CommPayPro helps our business to achieve a whole new level of efficiency we have not experienced before with other CRM’s. Better integration, better tracking, better service, BETTER overall. In comparing other CRM’s we have used, CommPayPro is the best option hands down for Satellite Services. As an Authorized EXEDE Retailer and Installer, CommPayPro has proven itself to be the BEST software solution without a doubt. So many automated features, user-friendly and at a lower price than the competitors. We are in for the long haul! We have been using CommPayPro for several months now. We are very pleased with the equipment tracking functionality and it has cut my payroll processing time by several hours. 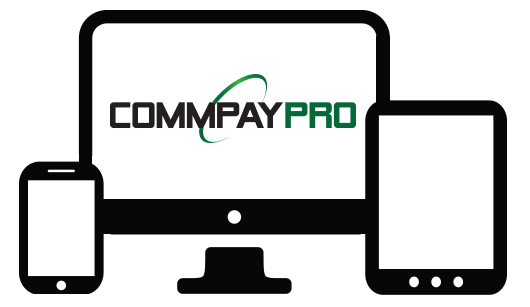 CommPay Pro is an extremely useful tool to have! Copyright © 1998-2019 CommPay Software. All Rights Reserved.